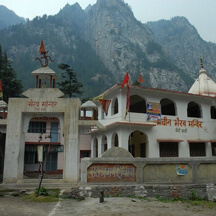 Gangotri Dham, located at the height of 3,100 meters (approx.) 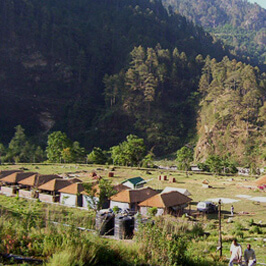 on the Himalayan range in Uttarkashi district of Uttarakhand, holds a very special place in the hearts of Hindus. 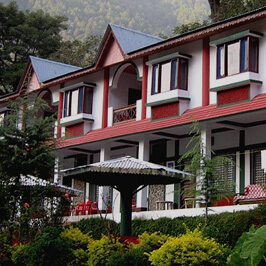 It is one of the four sacred and important pilgrimage sites of Chota Char Dham Yatra in Uttarakhand. 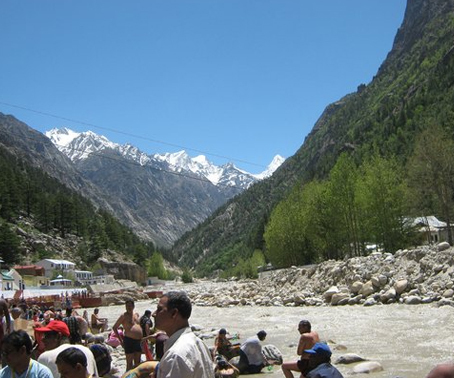 Amid all the natural beauty and grace which the mountains and altitude of the place affords, what makes Gangotri one of the holiest places is its intimate connection with River Ganga (the Ganges). Ganga Maa (mother), the much revered deity of Hindus, originates from the Gangotri glacier at Gaumukh which is some 18 km from the Gangotri town. It is said that Goddess Ganga came to earth in order to wash away the sins of King Bhagirathi's ancestors. From the folds of mythology till the present time, Ganga River has always been a sacred source of purity for the mankind. Coming to Gangotri for a religious tour is not only a religious duty but a spiritual calling too. Going by the legends, it is said that King Sagara, the great grandfather of King Bhagirath slayed the demons on earth. In order to proclaim his supremacy, he decided to stage an Ashwamedha Yagna. During the yagna , a horse was supposed to be let loose to go on an uninterrupted journey across empires. In the course of events, Indra the supreme ruler feared that he might be deprived of his celestial throne if at all the yagna got complete. Using his celestial powers, he took away the horse and privately tied it in the ashram of Sage Kapila, who was seated in deep meditation. As soon as King Sagara's agents realized that they had lost track of the horse, King allotted his 60,000 sons the task of tracing the horse. While the king's sons were on a hunt for the lost horse, they came across the spot where Sage Kapila was meditating. They found the horse tied next to him, out of fierce anger they stormed the ashram and accused the sage for stealing the hoarse. Sage Kapila's meditation got disrupted and out of fury he turned all the 60,000 sons into ashes just with his powerful glance. He also cursed that their souls would attain Moksha, only if their ashes get washed by the holy waters of River Ganga, which was then a river, seated in heaven. It is said that Bhagirath, the grandson of King Sagara in order to free his ancestors performed rigorous penance for a 1000 long years to please Ganga to come down to the earth. Finally his efforts bore fruit and River Ganga was pleased by his devotion and was ready to descend to earth. Another legendary tale states that when River Ganga agreed to descend to earth in response to Bhagirath's prayers, its intensity was such that the entire earth would have got submerged under its waters. To save the planet earth from such demolition, Lord Shiva caught River Ganga in his locks. To please Lord Shiva, Bhagirath again meditated for a very long time. On seeing Bhagirath's immense devotion, Lord Shiva being pleased released River Ganga in the form of three streams one of which came on earth and came to be known as the Bhagirathi River. As soon as Ganga's water touched the ashes of the Bhagirath's ancestors, the 60,000 sons rose from eternal rest. 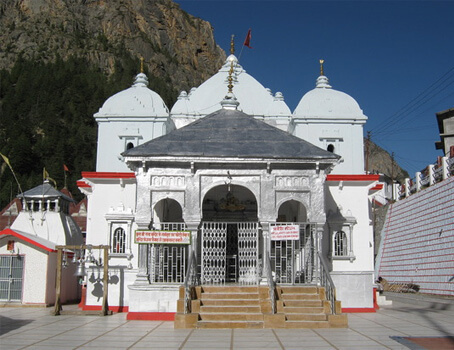 The stone on which Bhagirath is believed to have meditated is known as the Bhagirath Shila which is located fairly close to the Gangotri Temple. It is said in one of the mythological tales that Ganga, was a vivacious beautiful woman who was born out of Lord Brahma's Kamandalu (water vessel). There are two accounts of her birth. One proclaims that Lord Brahma while washing Lord Vishnu's feet had collected this water in his Kamandalu after Lord Vishnu had freed the universe from demon Bali in his rebirth as Vaman. Another legend states that Ganga came down to earth in the form of a human and married an ancestor of the Pandavs of the Mahabharat, King Shantanu. She is believed to have yielded seven sons who were thrown into the river by her and the reasons behind this are unexplained. Her eighth child, Bheeshma, was spared due to the intervention of King Shantanu. Ganga left him. Bheeshma is the one who later played a very crucial role throughout Mahabharata, the grand epic. 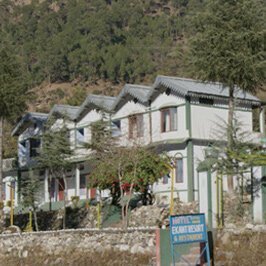 What to See in Gangotri Dham? 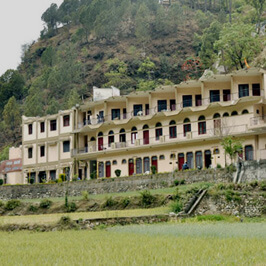 A picture of serenity, the humble abode of Maa Ganga is situated by the side of Bhagirathi River. 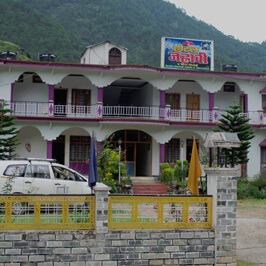 Located in Uttarkashi district of Uttarakhand, the revered temple is one of the four pilgrimages in the Chota Char Dham circuit of Garhwal Himalayas. Mother Ganga is present in the premises of the white temple building in the form of a small silver idol. The amazing mountain range of Himalayas and the flowing Bhagirathi by the side makes for a perfect setting to behold the life-giving, gentle yet powerful deity. The pilgrims are required to bath in the crystal clear waters of the pious river before visiting the main shrine. As the winter season gets ready to knock on the doors of the mountain region, Goddess Ganga gets ready to leave for Mukhyamath temple in Mukhba village, 20 km downstream. The transfer takes place on the auspicious day of Diwali (Oct/Nov) amid vedic chants and elaborate rituals. With greater joy and enthusiasm, the Goddess is brought back to the Gangotri temple on the occasion of Akshaya Tritiya (April/May). A Shivling made from natural rock is submerged under water and is easily visible in winters when the water recedes. It is said to be the place Lord Shiva sat on while he tied Ganga in his matted hair. Dividing it into 7 streams, Shiva saved earth from the massive force of Devi Ganga. To witness the holy birth of River Ganges at Gaumukh, one can take up a picturesque and exciting trek surrounded with peaks and soaring peaks. One can further trek to Tapovan which is about 4 km from Gaumukh. 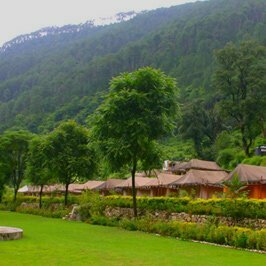 Tapovan has meadows, beautiful flowers, streams and incredible views of surrounding Himalayan Peaks such as Shivling and Bhagirathi. 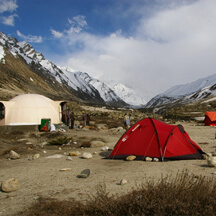 Tapovan is also a base camp initiating a number of mountaineering tours. Some 10 km downstream from Gangotri, near the point where Jadh Ganga (also called Jhanvi River) merges with Bhagirathi, lies the temple of Bhairon Nath. As per a legend, Bhairon Nath was chosen by Lord Shiva as the protector of the region. 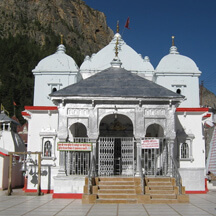 And every visit to the Gangotri temple should be followed by a visit to the temple of Bhairon. Moving about 3 km from Bhairon Ghati one can reach Lanka Chatti to witness one of the highest river bridges of the region; the bridge over River Jhanvi is quite a spectacle in its own right. 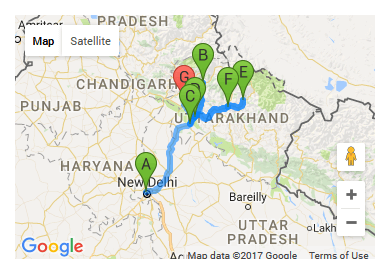 How to Reach Gangotri Dham? 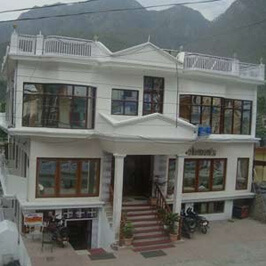 Jolly Grant airport, Rishikesh Road, Dehradun, is the nearest airport to Gangotri. Hire a cab or get a bus from here. Regular trains to Haridwar and Dehradun are available at all times of the year. Hire a cab or get a bus from here. 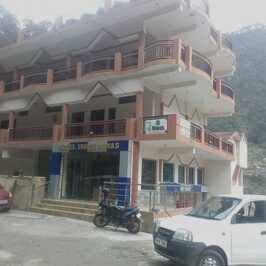 Gangotri is connected with motorable roads, and buses and taxes from important destinations like Rishikesh, Dehradun, Uttarkashi and Tehri Garhwal are easily available. 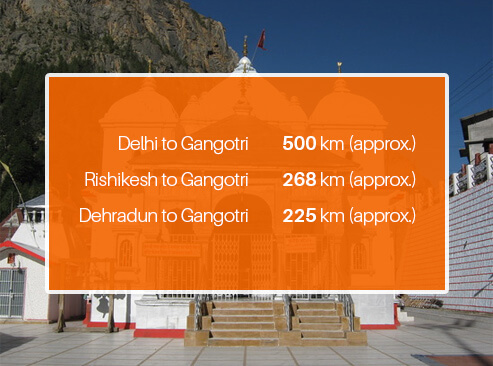 The best time to visit the Gangotri temple is from April/May to June and September to October/November. 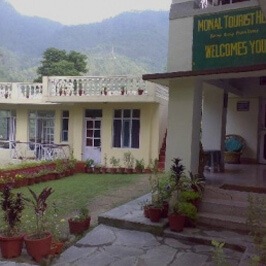 Monsoons bring a very real danger of landslides, floods and other problems while winters are characterized with heavy snow and freezing temperatures.